A Midlands-based company is currently bucking the trend by competing successfully in the world’s volume manufacturing market for truck and automotive components. The Managing Director of CNC Speedwell, Mark Lewis, puts their success down to a commitment to investment, an excellent workforce and a hands-on, shop floor approach that has helped them develop strong business relationships with eight leading OEMs. Consistently a Grade A supplier to leading truck and automotive companies around the world, CNC Speedwell has grown from a small machine shop turning over £120,000 per annum in 1991, to a company that employs over 160 people with an annual turnover of £15 million in 2005. The company, now part of Castings plc, is committed to delivering quality products on time and operates a five year investment cycle on machine tools in a constant drive to improve productivity and operating efficiency. In a bid to maximise ROI and simplify processes, CNC Speedwell only uses four different types of machines and keeps set-ups as standard as possible for speed of use and ease of training. As part of this standardisation, CNC Speedwell now uses Roemheld components on virtually all its machines. The company is also committed to hydraulic fixturing as it offers the tolerances, set-up times, quality and reliability CNC Speedwell needs. Roemheld has been supplying vertical and hydraulic fixturing components to CNC Speedwell for the past three years through its distributor, AC Hydraulics. CNC Speedwell uses the Roemheld components for intricate fixturing as they offer the repeatability and durability that such high volume manufacturing demands. Commonality of parts is also important as the company undertakes all its own maintenance. Using Roemheld removes the need to hold large amounts of spare parts as its distributor, A C Hydraulics, holds them in stock offering CNC Speedwell the lead times it requires for 24 hour a day manufacturing. CNC Speedwell manufactures over 400 different types of components for the truck and automotive markets. The company offers a ‘cradle to grave’ service as it can cast, machine, paint, assemble and then deliver the parts anywhere in the world. 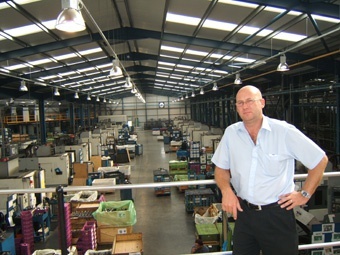 The company machines 400 tons of parts every week, of which 80% are destined for the export market. CNC Speedwell ships 24 hours a day and is one of a handful of UK manufacturing companies competing in the worldwide truck and automotive volume manufacturing market. From its Brownhills base, situated opposite the Group’s foundry, the company anticipates that this export business will expand by 30% over the next five months alone. Mark puts the success of his company down to the commitment of his workforce and the company’s ethos of investing in productivity gains. CNC Speedwell has invested over £27million in its machining business, with some £5 million in 2005/6 alone on new equipment. However, Mark insists it is not just about throwing money at the business, it is about constantly looking at how improvements can be made. 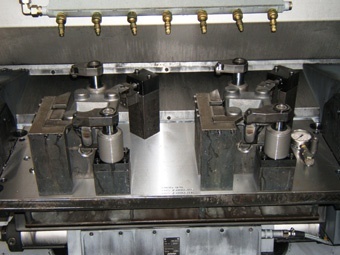 Two machining centres and five lathes handling seven jobs were replaced with a twin spindle machine with autoloading which freed up a third of the floor space previously being used and enabled the redeployment of four operators. The company has also invested in 30 Chiron machines so that double spindle machines now make up 65% of its machining capability, which has resulted in a 75% productivity gain, and Mark is now looking at sourcing four spindle machines.